If Christmas is the festive season for Catholics, for Hindus Indian Festvial Deepawali is equally important. Once upon a time, Deepawali was widely celebrated across India with fun and frolic. Today, the festival of lights has transcended all barriers, irrespective of age, caste, nationality and countries. 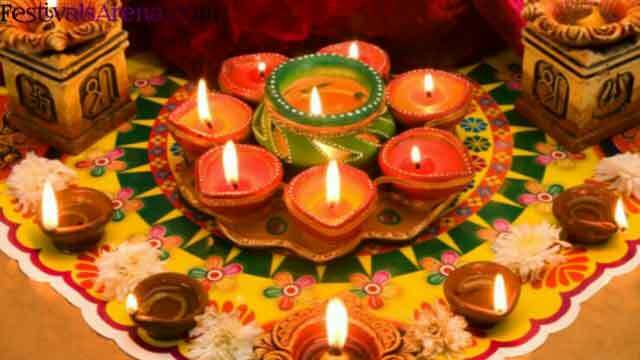 The word ' Deepawali ' means an array or row of lamps. It is celebrated with enthusiasm for five days. According to the Hindu calendar, it falls on the 13th dark fortnight during the month of Ashwin (October-November). The History of Deepawali tells that it symbolizes the victory of good over evil. It commemorates Lord Rama's return to his kingdom Ayodhya after being in exile for 14 years. It also hails his triumphant return after killing the wicked demon-Ravana. On this day, Lord Rama was crowned as the King of Ayodhya. It also marks the beginning of the Hindu calendar. For Indians, Deepawali is a pretext to be with family and friends. 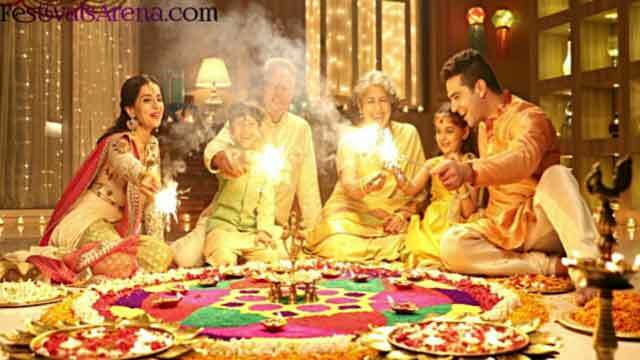 For working class families, it is an excuse to receive Deepawali bonus from their companies. For entrepreneurs, it is a best time to mint extra profits. The shops are illuminated with flashy colorful bulbs for nearly a month before Deepawali. Mega promotional campaigns and heavy discounts are offered to attract shopping freaks. For women, Deepawali is a busy period for whitewashing their homes. Old household items are discarded, and a new shopping list for household appliances for the year ahead is planned. Whitewashing of homes normally begins after Dusshera. Walls, cupboards and floors are scrubbed thoroughly to welcome Lord Lakshmi. Women gear up buying and grating ingredients especially dry fruits for preparation of sweets. For children and teenagers, Shopping is the buzzword to catch up their favorite accessories, gadgets and fashionable accessories. Deepawali is celebrated for five days. Each of these days has a significant traditions and customs attached to it. Indian homes are well lit with beautifully decorated miniature sized small earthen lamps called diyas. Off late, families have gone contemporary by lighting shimmering candles and lanterns in different shapes and sizes. The doorways are festooned with marigolds, palm leaves and rangoli designs. Families are attired in their elegant best in their rich Indian outfits. They exchange gifts, sweets, dry-fruits and of course, greetings on this festive occasion. Art and craft lovers unleash their creativity and innovation. They lay their hands on molding earthen lamps called 'diyas' with bright oil plants, ribbons, mirror work and other motifs. Diyas are illumined with cotton wick and ghee in rows across the verandahs and balconies. In contemporary age, families prefer gel and wax candles in elegant shapes with assorted aromatic perfumes. Rangoli is synonymous during Deepawali to welcome the guests. It is a traditional art of decorating courtyards and walls. Typically, it is done with powder of white stone, lime, rice flour and other paste to draw designs. Modern women prefer buying readymade rangoli organic powder available in attractive colors. Fireworks display is a sign of Deepawali celebrations. It is a sheer dynamite view in the dark skies to watch rockets and flowerpots exploding with light and sound effects. Indians are known to have sweet tooth. During Deepawali, they munch all kinds of sweets prepared from dry fruits, coconut, sugar, ghee and milk. The list of Deepawali mithais is long to mention. Sweets like gajar ka halwa, kheer, ladoos, gulab jamuns, and karanji, barfis, and ras malais. Are savored. Playing and gambling is very popular on Deepawali night. It is believed that on playing cards, the Goddess Lakshmi smile upon the player and ensures her goodwill for all year around. On this day, it is typical merriment time of families trying to prove their luck of earning great fortunes. With more and more families busy with their careers, Deepawali is the best time to bring together relatives and friends on one platform. Families organize get-togethers with a dash of songs, dance and a lavish array of Indian vegetarian buffet to rejoice in the festive spirit.